Size : 10.2 x 6.3 inches. / 26.0 x 16.0 cm. 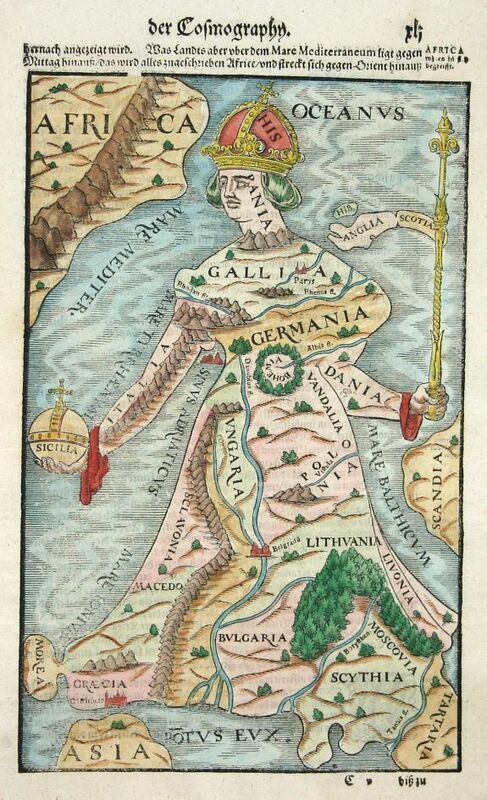 Description :This is one of the most famous of cartographic oddities showing Europe in the shape of a woman. The representation of Europa Regina or Queen of Europe, was first drawn by Jonannes Bucius in 1537. This simplified version appeared in several editions of Münster's Cosmography from 1580 onwards. West is shown at top with Spain forming the crown and head, France the neck and bust, Italy the left arm and Denmark the right arm holding a scepter with Britain as the flag. The remainder of the figure is a flowing robe with Greece and Russia at the feet. It has been argued that instead of a woman, the map represents Charles V of Spain, modeling a Europe that had Spain as its crown. Whatever the source, this is an extraordinary example of the art of mapmaking.